A mostly American subgenre, these are special television shows, often one-shots, created with a (northern hemisphere) winter or holiday theme for broadcast during the month of December. While some depict what the holiday specifically celebrates — the birth of Jesus Christ — or make it key to the plot in some way (for instance, A Charlie Brown Christmas involves the staging of a Nativity play), most are secular to appeal to as wide an audience as possible. Many prominently feature Santa Claus and his associated mythology. Some try to educate the viewers about the True Meaning of Christmas. Their plots often involve the characters Saving Christmas. 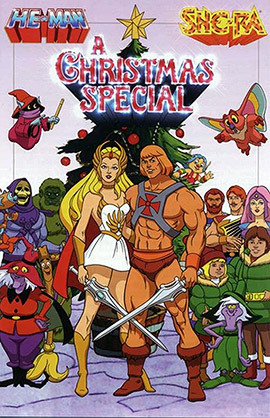 Perhaps the best-known Christmas Specials are the animated ones (including the stop-motion animations produced primarily by Rankin/Bass) from the 1960s through the 1970s that rerun annually. Far more numerous, though, are the various celebrity specials, which usually take the form of a low-key holiday-themed Variety Show. Usually the latter are rather forgettable by virtue of their one-off nature, but sometimes they can generate moments that survive decades. A case in point would be the Bing Crosby-David Bowie duet of "The Little Drummer Boy", which has taken on a life of its own above and beyond the 1970s-vintage Crosby special from which it sprang. Compare Christmas Episode (generally known as a Christmas Special in the UK), Easter Special, and Halloween Special. If the holiday celebrated in the special only looks like Christmas but is renamed to match the setting, it's a You Mean "Xmas". Disney put out From All of Us to All of You on its weekly show Walt Disney Presents in 1958. It featured new cartoon footage of Jiminy Cricket linking winter and celebration-themed excerpts from the Disney Animated Canon and Classic Disney Shorts. This special has received periodic updates and retitlings over the decades. While its last exposure in the U.S. was in The '80s (as 1983's A Disney Channel Christmas, retitled Jiminy Cricket's Christmas for a video release in '86), it continues to be a very big draw in the UK and Scandinavia. Sweden in particular loves this special. Kalle Anka och hans vänner önskar God Julnote Donald Duck and His Friends Wish You a Merry Christmas appears on Swedish television every December 24 without fail, and it's not an exaggeration to say fully half of the nation watches it. This Slate article details the tradition, from the perspective of an American observing his Swede in-laws watching it during a visit. Rudolph the Red-Nosed Reindeer: The Movie (1998) is mostly unrelated. There are three more Peanuts Christmas specials, made from The '90s onward, all of which the original easily overshadows: It's Christmastime Again, Charlie Brown (1992), Charlie Brown's Christmas Tales (2002), and I Want a Dog for Christmas, Charlie Brown (2003). Charlie Brown's Christmas Tales was created specifically to pad out an hour timeslot for A Charlie Brown Christmas so that it wouldn't have to be Edited for Syndication. In France, Le Père Noël est une ordure (1982) is broadcast virtually every single year on one of the six main channels around Christmas. It's actually a very dark comedy; one of the characters, the one actually called an "ordure" works as a Mall Santa. It was remade in the United States as Mixed Nuts. Two Smurfs Christmas specials, "The Smurfs Christmas Special" (1982) and "'Tis the Season to Be Smurfy" (1987). The Smurfs: A Christmas Carol (2011) is this for The Smurfs film series. The Wish That Changed Christmas (1992): Based on the book "The Story of Holly and Ivy"
The Twelve Days of Christmas (1993): Promoted as "the true story of the Twelve Days of Christmas". Featured the voices of Larry Kenney and Phil Hartman. The Night Before Christmas (1994) was one of several made by Golden Films. The True Meaning of Christmas Specials (2002) with Dave Foley of The Kids in the Hall (and NewsRadio) fame. The Rapsittie Street Kids: Believe in Santa (2002): A dreadfully animated CG musical that was lost media until it was recovered in 2015. The newest incarnation of Doctor Who has a Christmas special every year, starting with the second season. The Ninth Doctor story "The Unquiet Dead" is a Christmas special within the regular series. Moral Orel's first season finale (aired as the first episode) was one with a Downer Ending. Its series finale, which had some parallels was a lot more positive. I'll Be Home for Christmas (2006) was actually the first animated adventure of Toot & Puddle, released directly to DVD and also aired seasonally on Nick Jr. back when it was known as Noggin. It was based on the book by the same name and featured Toot traveling to Scotland to visit his grandmother for her 100th birthday, while Puddle stayed home with Opal and the two decorated in the hope that Toot would be back in time for Christmas. There are two specials based on the "Yes, Virginia, There Is a Santa Claus" letter. The first one dates to around 1975, and was directed by Bill Melendez of Peanuts fame (the special has a Charlie Brown-esque look to it). The second, more recent one, was made in 2009, and featured Alfred Molina as the editor of The New York Sun. The Venture Bros. Christmas episode "A Very Venture Christmas" introduced the Krampus to much of America. The Adventures of The League of S.T.E.A.M. had "The Fright Before Christmas". Ice Age gave us "A Mammoth Christmas"...with no explanation on how talking animals can celebrate a holiday honoring someone who wouldn't be born until long after the animals are dead. Winx Club has "A Magix Christmas", where Bloom teaches the other characters, who aren't from Earth, about Christmas. Holly Hobbie and Friends: Christmas Wishes: A rather more unusually traditional one for today's time, in a series that otherwise isn't overtly Christian. While it doesn't overtly pedal Christian religious themes, it does include a fully traditional Christian pageant, with an original manager a;song called "There's No Room at the Inn," and both Christian and non-Christian Christmas songs, such as "Jingle Bells" and "Oh Holy Night." Power Rangers has quite a few! Mighty Morphin' Power Rangers had "Alpha's Magical Christmas", a non-canon direct-to-video special, and "I'm Dreaming of a White Ranger", which is canon. Power Rangers Zeo had "A Season To Remember"; it aired as the season finale, but takes place and was produced in the middle of the season. Power Rangers Samurai, which was split into two seasons, had two clip show Christmas specials — one for each season. Elf: Buddy's Musical Christmas (2014) An Animated Adaptation of the stage musical adaptation of Elf. Ping Pong: An unorthodox one, at best. The manga never added any scenes implying Christmas had passed. However, Yuasa and his team made sure Episode 6 changed that. The episode covers material that was in Chapters 5, 6, and 7 of the second volume. In addition, it plays out how the five prodigies spent Christmas following the first tournament. We Wish You A Merry Walrus (2014) is the first entry of a Club Penguin TV special series. It's about a group of penguins who must save Christmas. Olaf's Frozen Adventure (2017) is a Frozen short that is about Olaf trying to find the perfect holiday tradition for Anna and Elsa to celebrate since they don't have one due to being separated for years. The Amazon Studios If You Give A Mouse A Cookie was followed up by the special If You Give a Mouse a Christmas Cookie. Trolls Holiday, based on the film of the same name, follows a pretty similar premise to the Frozen short mentioned above. RWBY Chibi gives us two — "A Slip Through Time and Space Pt. 2", which is just one long Product Placement ad for the Rooster Teeth Store, and "Nondescript Holiday Spectacular", which is a parody of How the Grinch Stole Christmas!.